Testing questions ranging from The Old man of Lochnagar to Citizen Kahn. The Picture Round is Dr Who? and the Wild Card is a timing question on the 1980s racehorse Shergar. Q09. Which famous person wrote the children’s story The Old man of Lochnagar? Q15. Which Jamaican born singer played May Day in the 1985 James bond movie A View To A Kill? Q26. In what sport might you suffer from ‘the bonk’? Q32. In which UK city is the BBC sitcom Citizen Kahn set? Here’s a low-res sample of the Dr Who? Picture Round, click for a higher resolution version. The Picture Round download is a four page high quality PDF. The first two pages are name the actor that plays the Doctor with the answers, the second two pages include an additional point for putting the Doctors in order! 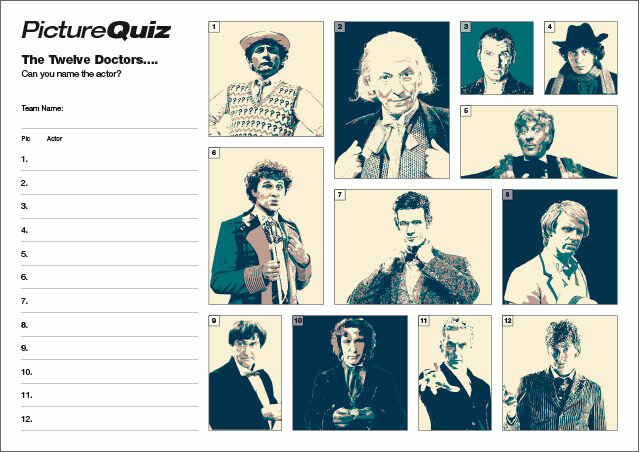 Quiz 58s Picture Round is the twelve Doctors… can you name Who the actors are? The Wild Card for Quiz 058 is a timing question on the 1980s racehorse Shergar.